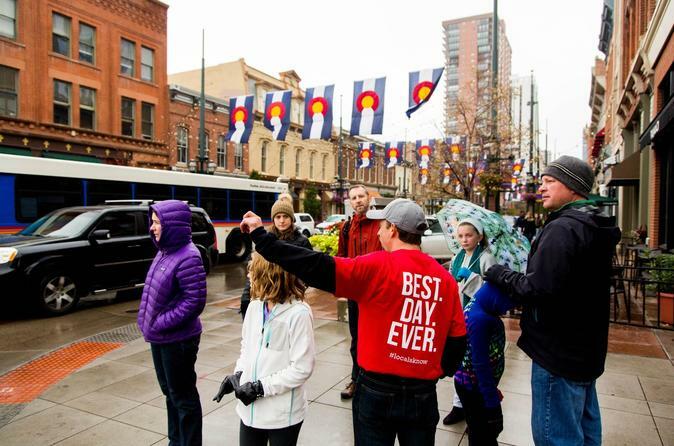 All the top highlights of Denver in one tour! Explore the original founding ‘twin cities,’ dine out with us at one of our favorite local restaurants and then snap some seriously scrapbook-worthy selfies with our best sculptures and landmarks — eat your heart out Eiffel Tower! You won’t have to hold your breath either, as you stand exactly one mile above sea level for the perfect memory of your stay in the mile-high city. We wanted to call this The Selfie Tour, given all the great photo opportunities we will pass along our route; from the Colorado state flags spanning across Larimer Square to the Iconic Blue Bear, four-storey Dancing Aliens (okay, they’re called "The Dancers"), the D&F clock tower and the eclectic sculptures along the 16th Street Pedestrian Mall, your Instagram account will thank you for taking this tour. Your tour launches from Union Station, a focal point in the rapid growth of Denver during its early years. We’ll move towards Cherry Creek; one of the two rivers which flow into Confluence Park and site of the original settlements around what would later become the Denver we know today. Cherry Creek used to be a dumping ground but it has been transformed in recent years into a family playground and kayaking paradise. The river flows alongside the main commuter path that attracts most of Denver’s local bikers and joggers. Weaving back into town, it’s time for a snack and we think our favorite French creperie is the perfect solution no matter whether you’re looking for something sweet or savory. From there it’s a quick walk to the original site of Denver City (St. Charles), which eventually merged with the encampment on the opposite side of Cherry Creek (Auraria). Here we explore the back alleys, pointing out a speakeasy or two you might want to try later. Once we are fully acquainted with the best of Larimer Square, it’s time to get your selfie sticks ready. Next up is a stroll through Sculpture Park, home to Denver’s famous 50-foot sculpture “The Dancers.” After we’ve exhausted all possible angles, we’ll cut through Denver’s Performing Arts Complex, where we’ll check to see what’s playing tonight on any one of the multiple stages. The selfie opportunities are not over, not by a long way! Our next stop is an epic selfie with “Big Blue,” the three-storey blue bear, which peers into the Colorado Convention Center. This giant and universally loved artwork is officially named, “I see what you mean.” From here the tour makes its way over to the 16th Street Pedestrian Mall (not really a mall, despite the name), which spans downtown and is lined with eclectic art, street performers and public entertainment. A tour of Denver wouldn’t be complete without showcasing the works of some of our most creative local artists. We’ll make a stop at the I Heart Denver store; everything inside was created in Denver, funnily enough. Another must-do during your stay is a visit to the US Geological Survey’s official geological pinpoint of 5,280 feet, which confirms the city’s location, one mile above sea level. Once everyone has the perfect selfie at exactly one-mile-high, the 16th Street shuttle will scoot us down to the famous Daniels and Fisher clock tower. We finish our tour with a quick shuttle ride back to Union Station, where you can continue your exploration of Denver’s great food, drink and entertainment offerings. Special Offer - Travel by September 30 and save 35% off our previously offered price! - Book Now!